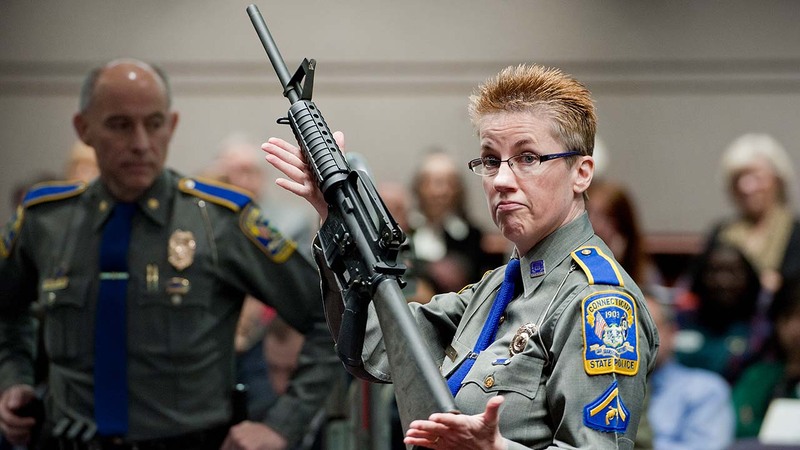 Detective Barbara J. Mattson, of the Connecticut State Police, holds up a Bushmaster AR-15 rifle, the same model of gun used by Adam Lanza in the Sandy Hook School shooting. HARTFORD, Conn. -- A judge on Friday dismissed a wrongful-death lawsuit by Newtown families against the maker of the rifle used in the Sandy Hook Elementary School shooting massacre, citing an embattled federal law that shields gun manufacturers from most lawsuits over criminal use of their products. The families were seeking to hold Remington accountable for selling what their lawyers called a semi-automatic rifle that is too dangerous for the public because it was designed as a military killing machine. Their lawyer vowed an immediate appeal of Friday's ruling. But the families' attorneys argued the lawsuit was allowed under an exception in the federal law that allows litigation against companies that know, or should know, that their weapons are likely to be used in a way that risks injury to others, and the judge disagreed. "While the families are obviously disappointed with the judge's decision, this is not the end of the fight," said Joshua Koskoff, a lawyer for the families. "We will appeal this decision immediately and continue our work to help prevent the next Sandy Hook from happening."